The 8x42 US Army Monocular with Compass from Bower utilizes a BAK4 roof prism optical design with anti-reflection multi-coated optics to create images that are both clear and bright. 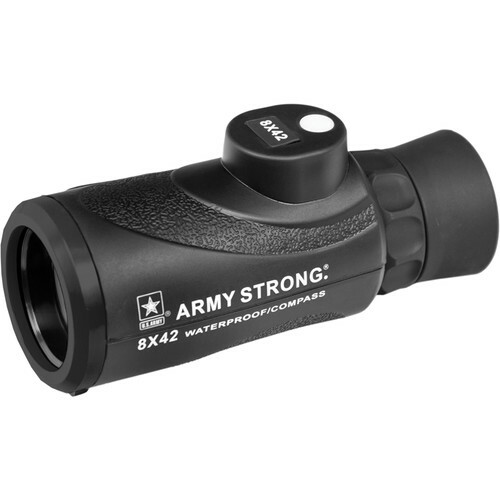 It is waterproof, and with a comfortable 8x magnification and 56° apparent field of view, subjects are easy to see, identify, and track with less noticeable shake than with higher-power monoculars. The generous viewing angle reduces wave-action discomfort at sea and provides expansive views. An integrated magnetic compass with in-view display provides easy-to-see bearing readouts while navigating. Non-slip rubber armoring helps maintain a firm grip on the monocular, while the fold-down rubber eyecup makes it easy to use with or without eyewear. Box Dimensions (LxWxH) 8.0 x 6.5 x 3.0"
What country is the US Army 8x42 made in? Also I wish you would list or make it easier to find where the different products are made at. According to the information we have, our current inventories Country of Origin is China. Please be aware this can change over the product's production life without notice. What is the closest distance it will range to? For the Magnification it is not really determined like this. It is as far as the eye can see 8X Closer to what you are looking at.